A festival, where autumn chrysanthemums decorate the temple, will be held this month. 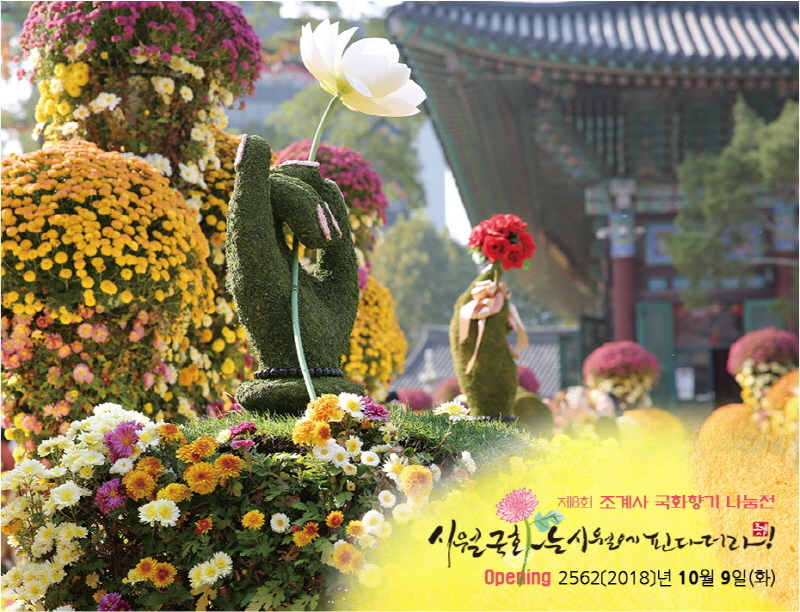 Jogyesa Temple along with Hampyeong County of Jeollanam-do Province are opening the chrysanthemum scent sharing event titled “October Chrysantemum Blooms on October” at 14:40, Oct. 9. The chrysanthemum scent sharing event, which has been held for eight consecutive years, will contain flower decorations depicting Budda’s enlightenment and Buddha’s first teaching to five of his disciples about Four Noble Truths, Noble Eightfold Path and Dependent Origination. The exhibition also included decorations, from last year, in shapes of an elephant, a dragon, a child bodhisattva and characters from Journey to the West. Jogyesa Temple will also hold special events, along with the chrysanthemum scent sharing, where one can taste temple food and enjoy music at night (Oct. 10), Chrysanthemum Offering Ritual for Double Ninth Festival (Oct. 17), 7th Memorial Dharma Ceremony for the Local Community (Oct. 27), Making Chrysanthemum Lanterns with Family (Oct. 21), 10th Job Fair (Oct. 24) and Children’s Art Contest (Nov. 4). The chrysanthemum lantern making event will be held at 14:00, Oct. 21 for 40 Buddhist families with two or more pre-school children. The event will include making the lantern, family recreation and award ceremony. There also will be special performance by Jogyesa Temple’s cultural groups including the Scholar Tree Choir, Scent Dance Team, Children’s Choir, Children’s Band, Pure Sound Choir and Traditional Music Team at the deck in front of the Main Dharma Hall. The opening ceremony on Oct. 9 will be held in the order of ribbon cutting ceremony, congratulatory performance by Children’s Choir, conratulatory remarks, scholarship granting ceremony, prayers and admiring the flowers.